The East 67th Street library will hold a series of events to kick off the oral history project and encourage people to share their stories, like in a memory circle, where people tell their stories in a group. UPPER EAST SIDE — Do you have a cherished memory of living on your block? How about an unforgettable story worth telling all your neighbors? The New York Public Library wants to record your stories for its new Upper East Side oral history project, which will store hundreds of memories as told by longtime residents online and in the library's large history-preservation collection. The East 67th Street branch will begin recruiting storytellers and people to interview them in February. "When working at the reference desk, people want to tell us stories but we normally don’t have time to listen, and we feel bad," said Rebecca Donsky, the library's manager. "We're hoping to get them to an official forum to share, talk and reminisce. New York has changed so much. The corner where your favorite candy store was might now be a bank." Those who want to participate will be interviewed and recorded by microphone. The recording will then be uploaded onto NYPL's online archive so that future generations will be able to learn about what the Upper East Side was like and how it has changed, according to Donsky. If participants have old photos, the library would likely include them in its archives as well. "The idea behind this is people sharing their personal histories in the way they want to, and in the process they uncover all sorts of things, from the larger history of the city down to their neighborhood or their community," said Alexandra Kelly, NYPL's manager of adult programming and outreach services. "We're looking for things that we wouldn’t normally be able to uncover if these people were interrupted and asked a whole bunch of specific questions." NYPL has been recording stories from community members across the city since 2013. "In all the projects, an incredible thing happens — it turns everyday people into celebrities," Kelly said. "It is an opportunity for them to make sure their story gets heard and preserved. "I only hope that this experience happens for other people, so they feel they can talk to their neighbors and connect to people they didn’t know before or get to know their neighbors better because of the stories they share." 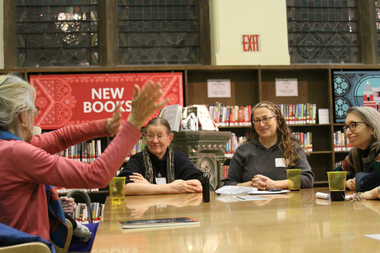 On Feb. 24 and 27, the 67th Street library will hold orientation sessions that will go over what the project entails, feature finished recordings from other neighborhoods and talk about what the library is looking for in interviews with storytellers. Once a month, from March through June, the library will hold "memory circles," in which a group of residents can get together and share their childhood memories of growing up on the Upper East Side. Interviewers will undergo training with the library to learn how to ask more open-ended questions and ask the interviewees questions, she said. The push to set up the Upper East Side oral history program will go for six months starting in February, but people can always add their memories, Kelly added. For more information on how to get involved, contact Alexandra Kelly at 212-621-0552. The orientation sessions will be held at 328 E. 67th St. on Feb. 24, from 6 to 8 p.m., and on Feb. 27, from 3 to 4:50 p.m.